This incredibly simple Caprese Chicken Recipe tastes way too good to be made so easily and have just 5 Points per serving. A handful of ingredients come together to create an amazing Weight Watchers Chicken Recipe that is mouthwateringly delicious. 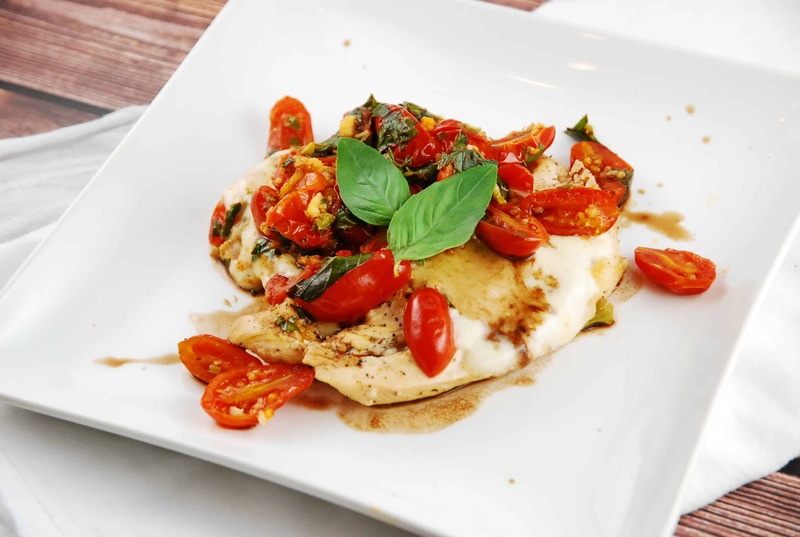 Tender chicken breasts topped with fresh melted mozzarella cheese, tangy cherry tomatoes and peppery basil makes for serious mouthful of perfection. And each serving is just 5 Points! If you want a quick and easy chicken dinner that is sure to impress, this Caprese Chicken is what you need to make. This has become one of my favorite dishes. Moist, juicy chicken topped with fresh tomatoes, basil and mozzarella equals a party in your mouth. This succulent Weight Watchers chicken recipe is an explosion of flavor and makes watching what you eat feel amazingly good. Melt 1 tbsp butter in a large, nonstick skillet over medium high heat. Generously season chicken breasts with salt and pepper. Add chicken to pan, cover, and sauté about 5-8 minutes per side, or until chicken is thoroughly cooked through. While chicken is cooking, melt remaining tbsp of butter in another nonstick skillet over medium high heat. Add the minced garlic, cherry tomatoes, and 1-2 tbsp chicken broth, and cook, stirring occasionally, until tomatoes begin to soften and wrinkle, about 5-8 minutes. Stir in the basil and turn off the heat. Once chicken is cooked through, turn heat to medium, top each piece with two slices of the mozzarella, pour the tomatoes over the top of the chicken, cover and cook just until mozzarella is melted, about 2 minutes. Hi. I work as a Personal Chef and almost all of my clients are on low-sodium diets. I love your recipes but how do I get the information on sodium? Made this tonight. I am a very novice cook but was able to pull this one off with relative ease. Suggested portions were way too small for me as a grown man. I just doubled up and took the 10 point hit. 1/4 of chicken just was not satisfying for my appetite. Flavor was very good.